When you select the Pencil tool, its properties and options appear in the Tool Properties view. 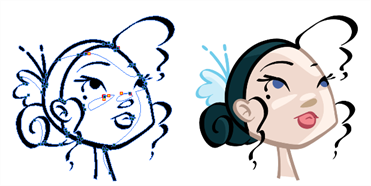 You can use these properties to change the size of the pencil line, define how the line size responds to pressure on the stylus, how the line acts in relation to other lines in the scene, and how to modify the line’s direction and size after it has been drawn. You can set the minimum and maximum sizes of your tool, which will produce the thick and thin effect on your line. This works with the pressure sensitivity of a pen tablet. Also, you can optimize the smoothness of the contour of lines. You can modify the central line smoothness of your line using this option. This parameter smooths the initial movement of your line. Increasing the value will result in a smoother line with fewer less control points. There are several line shapes to choose from. You can select how the start, end, and joints in the pencil line are drawn. Using the Pencil tool, you can draw invisible lines. This can be useful to draw tones and highlights directly on the character. In the Tool Properties view, click the Brush menu, and select Small Thumbnail, Large Thumbnail, or Stroke View. 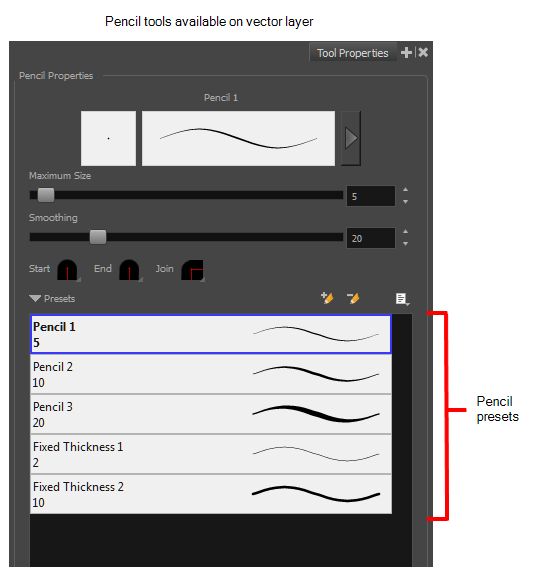 In the Tool Properties, select a pencil style from the Presets section. Click the Add Brush button. The new pencil style appears in the list of presets. In the Tool Properties view, select a pencil to rename. From the Brush menu, select Rename Brush. Type in a new name for the pencil. In the Tool Properties view, select a pen to delete. ‣ Click the Delete Brush button. ‣ From the Brush menu, select Delete Brush. The Properties window of the current tool opens. ‣ Maximum Size: Defines the maximum width of the line. ‣ Minimum Size: Defines the minimum width of the line as a percentage of the maximum size. 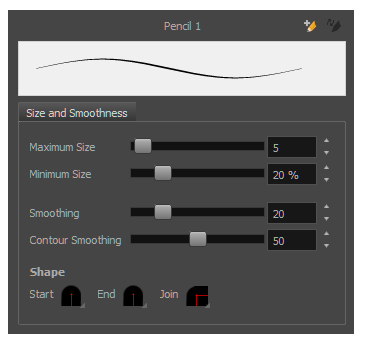 ‣ Contour Smoothing: Defines the number of control points added to the contour boundaries (around the line). Lower values mean that the line will appear as you draw it (with more control points along the centre line). Higher values mean that the line will be smoothed out (removing control points from the centre line). In the Pencil Properties window, click a line shape in the Shape section. ‣ Start: Make the beginning of the line round or flat. ‣ End: Make the end of the line round or flat. ‣ Join: Make joints round, mitred, or bevelled. Select the panel and layer on which you want to draw. In the Tools toolbar, select the Pencil tool or press Alt + 9. In the top menu, select View > Extras > Show Strokes to display the invisible lines in the Stage view. In the Tool Properties view, set the size to 0. You can also adjust the smoothness. You can modify the stroke shape with the Contour Editor tool—see About the Contour Editor Tool.